More than 4.4 million people talked about the Rio Olympics online this past weekend. RIO DE JANEIRO: The 2016 Olympic Games are already shaping up to be the most social games of all time, partly due to the rise of Instagram, Facebook Live, and Snapchat, which became popular after the 2012 games. 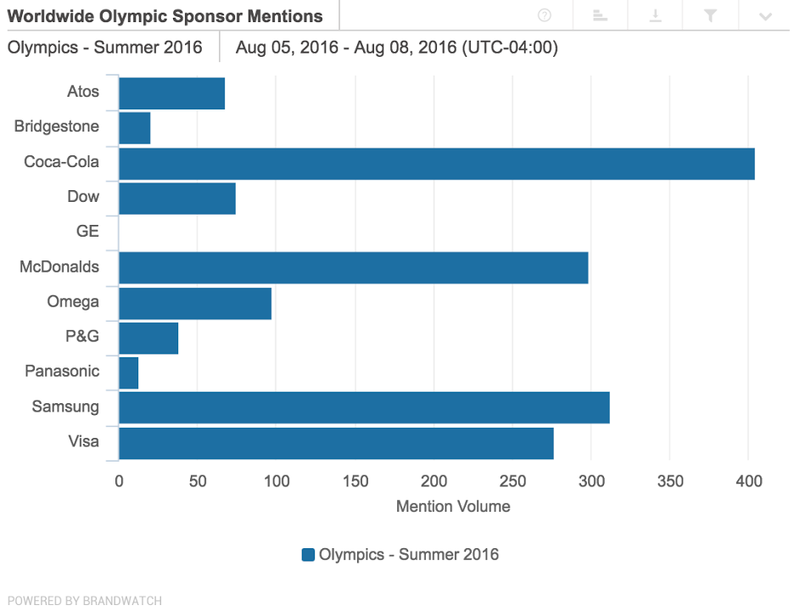 Brandwatch, a software company that analyzes social media for marketers, has compiled data from social media and other online media to see just how many times people were mentioning the Rio Olympics — and what topics, brands, and players people were talking about — during the opening ceremony and first weekend of the games. According to the firm’s analysis, the Rio Olympics were mentioned more than 4.4 million times online from Friday, the day of the opening ceremony, to Monday morning. The opening ceremony alone, which celebrated Brazilian culture, saw nearly 875,000 mentions between 7 p.m. EST on Friday and 12:30 a.m. EST on Saturday. There’s no doubt that there was a lot to talk about, even beyond the competitions. During the opening ceremony, for instance, social media was ablaze with complaints about NBC’s delayed broadcast, the hefty amount of commercials, and the NBC Olympics CMO’s controversial comments about women. 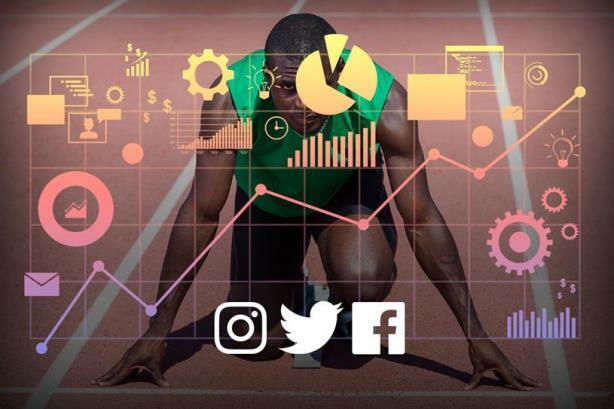 But when Brandwatch examined mentions minute-by-minute over the course of the opening ceremony, three moments stood above the rest, winning the gold, silver and bronze for engagement. The entrance of Team U.S.A. at 10:12 p.m. EST saw the most engagement, resulting in around 4,700 mentions in one minute. The conversation was fueled by the excitement over Michael Phelps, the most decorated Olympian of all time with 19 gold medals, who led the U.S. team as flag bearer for the first time. Taking silver, with over 4,500 mentions in one minute at 9:04 p.m. EST, was the ceremony’s global warming and climate change message. 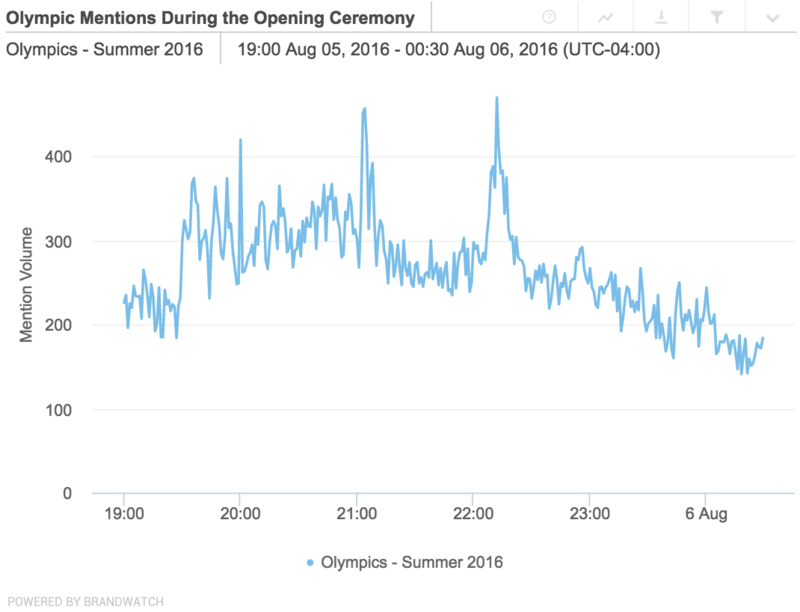 And the bronze, with 4,200 mentions in a minute, went to the public’s excitement over the start of the opening ceremony. Included in these messages were Olympians themselves, like Australian tennis player Daria Gavrilova. 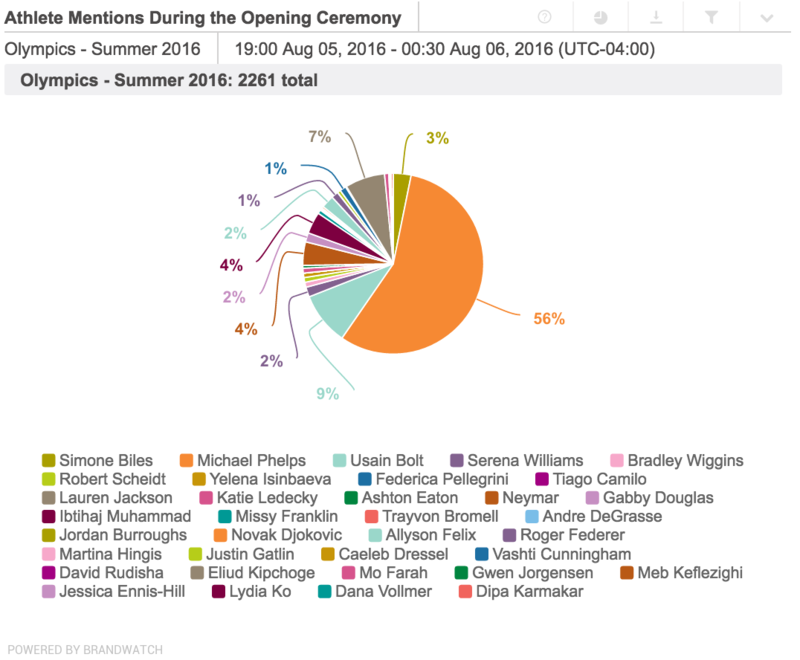 Phelps was the most talked about athlete during the opening ceremony, with 56% of the 2,261 references about athletes during the opening ceremony made about the swimmer, who is competing in his fifth and final Olympics. Following Phelps, at a far second with 9%, was the "fastest man alive," Jamaican runner Usain Bolt. And when it came to watching the actual sport events over the weekend, audiences mentioned specific sports 43,308 times. 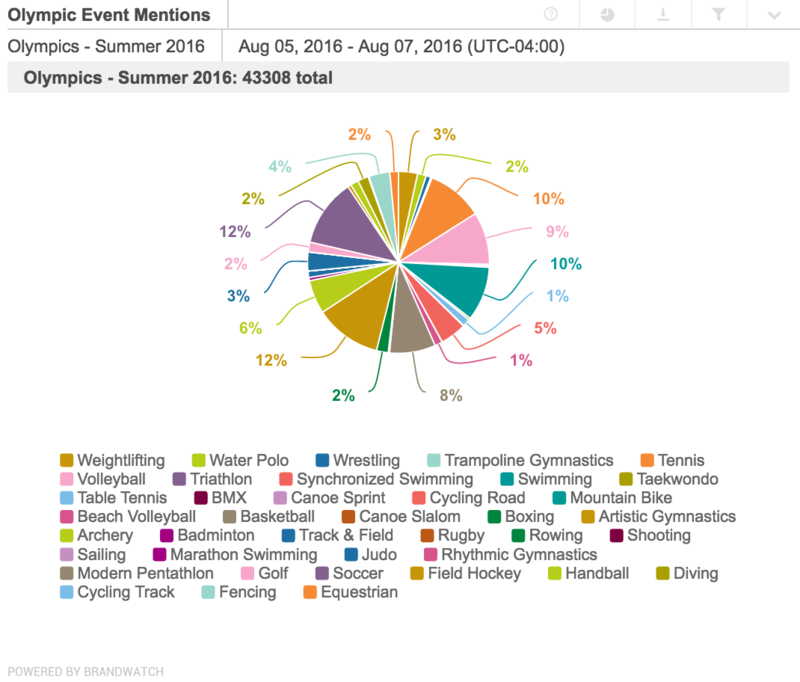 Gymnastics and soccer were the most popular sports, both claiming 12% of the total mentions. Other popular topics over the weekend included: Ginny Thrasher’s win of the games’ first gold medal in the air rifle competition, with 19,400 mentions; the injury that French gymnast Samir Ait Said sustained, with 24,890 mentions; and British swimmer Adam Peaty’s gold win on Sunday night, mentioned more than 26,000 times. Team U.S.A. may be leading the games with 12 total medals so far, but what about the brands? Brandwatch analyzed the online mentions of the 11 official worldwide sponsors and found that four of the brands were leading the conversations: Coca-Cola, Samsung, McDonald's, and Visa. Coca-Cola took gold, with more than 4,000 mentions; followed by Samsung, with over 3,100 mentions, McDonald’s, with more than 2,900 mentions; and Visa, with more than 2,700 mentions. To compile the data, Brandwatch sifted through 80 million sites, including all public Twitter, Facebook, and Instagram accounts, news sites, blogs and forums.